St. John’s wort is an herbaceous perennial growing in many areas around the world and has a long history of herbal use. It fell out of favour in the nineteenth century but recent research has brought it back to prominence as an extremely valuable remedy for nervous problems. In clinical trials about 67% of patients with mild to moderate depression improved when taking this plant. The flowers and leaves are analgesic, antiseptic, antispasmodic, aromatic, astringent, cholagogue, digestive, diuretic, expectorant, nervine, resolvent, sedative, stimulant and vulnerary. 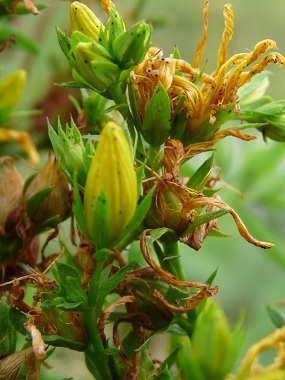 This cheery yellow-flowered plant is used in treating a wide range of disorders. The common name comes from its traditional flowering and harvesting on St John's day, 24th of June. 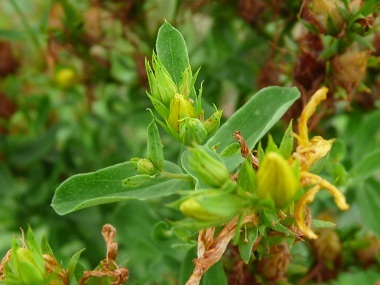 Distinguishing Features: St. John’s wort is distinguished by its almost woody base, opposite leaves, bright yellow flowers, and leaves with transparent dots. Flowers: St. John’s wort flowers are bright yellow. Numerous flower clusters are at ends of branches with each flower measuring about 2 cm across. It has five yellow petals with several, small, black dots along the margins; it also has many stamens in 3 clusters and a single pistil in the centre. 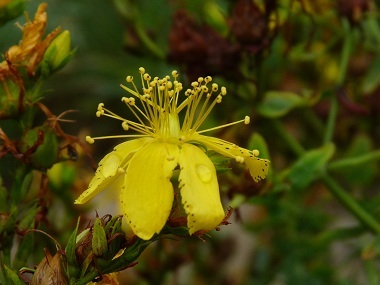 St. John’s wort blooms from June to August. Fields of Nutrition has medicinal benefits and vitamin/mineral content of St John's Wort. Leaves: Leaves are very identifiable as they have transparent dots throughout the tissue and occasionally with a few black dots on the lower surface. The leaves exhibit obvious translucent dots when held up to the light, giving them a perforated appearance, hence the plant's Latin name. It has opposing, stalkless, narrow, oblong leaves that are about 15 mm long. Height: This plant can grow to 1 metre high. 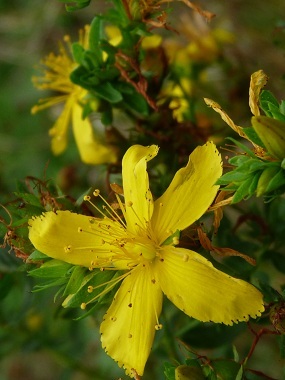 Habitat: St. John’s wort is commonly found in dry, gravely soils, fields, pastures, abandoned fields and in other sunny locations throughout many parts of the world, including central and eastern Canada. Edible parts: The aerial plant is dried for a variety of uses. Fresh flowers are used in making healing oils and they can be tossed into salads. Fresh leaves can be used in salads.